Saving the world has never come easy and Kaylee Cavanaugh's died to prove it. 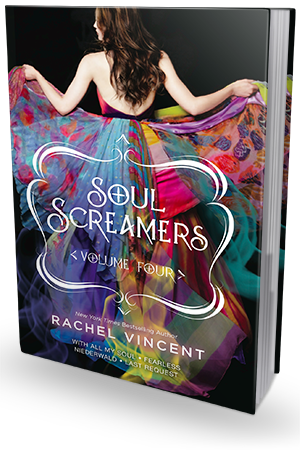 The final collection of New York Times bestselling author Rachel Vincent's Soul Screamers series is packed with emotion, with intrigue, with secrets, with family and above all, with love. "Just because you don't like someone doesn't mean you can feed her to a hellion," Em said. "Haven't we been over this?" I was the center of attention when I'd secretly died, yet somehow I was still the center of attention now that Em had secretly lived. I couldn't win for losing. Ira shrugged. "That's just as well, because justice isn't really what you want." He leaned forward again, and his gaze intensified, as if he were looking for more than he could possibly find in my face. Behind my eyes. "Your wrath is graceful. Has anyone ever told you that? Your angers has the bold, sweet overtones of blind rage, but the delicate tang of self-righteousness, because you actually think you're after justice. But that's not true, is it? You know there is no justice to be had. Nothing can bring the dead back to life or unscar the wounded. But you still want to hurt them, don't you? You still want to kill Avari in cold blood for what he's done to you. That, my sweet, vengeful little flame, is revenge, not justice." "I love you. I will love you until the sun devours the earth and takes us all to a fiery grave, and when that happens, the last word on my lips all be your name. Until then . . . I will carry on." Oh Kaylee, Kaylee, Kaylee. Kaylee is out for justice *cough*revenge*cough*. It's hard to believe that the events of the entire Soul Screamers series has come to an end - even harder to believe that in their world everything only happened over a couple months, just shy of a year, I'd say. And Rachel does not disappoint. With All My Soul is filled with the same witty dialogue we've come to love and our ever growing cast of characters. After Emma's kinda sorta death, Kaylee is bound and determined to stop Avari at all costs. She's had enough and she's done with her friends and family always in danger. I will admit that, much like Sabine, I'd come to find Kaylee's martyrdom a little tiresome. But at the same time, that's one of the things that makes Kaylee Kaylee. She puts her friends and family before her well being, even after promising them she will no longer do anything crazy without informing them first. Even I knew she was lying - come on, Tod! Rachel has truly outdone herself in With All My Soul. I was laughing, crying, smiling, screaming - the whole range of emotions. It was difficult to but this book down! I mean, everything is finally coming to a head here! Kaylee is enacting a crazy plan, relationships are being tested, and people are going missing in the Netherworld. The Soul Screamers series quickly became a favorite of mine from book one and I thoroughly enjoyed the ride. 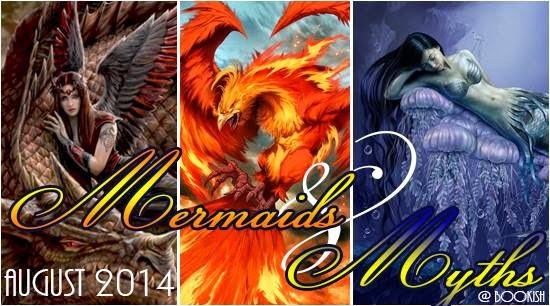 It's an amazing series that will filled with lovable (and constantly developing) characters that will take root in your heart while each individual novel takes you through twists and turns that keep you guessing until the very end. Baby Sabine! Well, not baby, but this takes place about a year before My Soul to Lose. Sabine has just entered the group home after breaking parole and essentially being kicked out of her foster parents' house. Fearless shows us the early relationship between Sabine and Nash and if I had read this prior to Kaylee and Nash, I might have been pulling for these two crazy kids when she showed back up in My Soul to Steal. Although Sabine has always been able to take care of herself, this really feels like the turning point where she is on her own and can only count on herself. We know she loses touch with Nash and that during this point Tod dies, but seeing these events from Sabine's eyes really puts her character into preservative and you can't help but feel for her and the obstacles she has a head of her. It took a long time for Sabine to grow on me. I didn't really become a fan of hers until With All My Soul. Anyway, Niederwald is a neat peak into the relationship between Emma and Sabine and gives Emma something more to do than just be protected and saved (this is not what I think, but coming from comments Emma makes during With All My Soul. BE AWARE THIS REVIEW CONTAINS A SPOILER FOR WITH ALL MY SOUL. PROCEED WITH CAUTION! I loved seeing Tod and Nash bond in Last Request. It a bit heartbreaking as this takes place two years after Kaylee has "died," but ultimately we know it's all going to be okay. On a mission to tie up loose end, Tod and Nash decide to go after Thane. I like that the narrative switched between Tod and Nash and it is interesting to see how Kaylee's death hit the two brothers in different ways. The last chapter is especially emotionally traumatizing and I took Rachel's advice from the beginning of on the collection and reread the last chapter of With All My Soul, and all was once again right with the world.